The holiday season always finds me with candles on the brain. When I begin to Christmas shop for my family and friends, I can’t help but stop by Bath & Body Works or Yankee Candles to do a little window shopping for myself. Now that so many different candle manufacturers seem to always be churning out their own limited edition scents and sets, candles I’ve never seen before always seem to pop up around this time of year. A candle is the perfect holiday gift. When you gift one, you’re gifting more than just a thing, but a relaxing experience, too. They’re so universally well liked that you can even give them to new friends or work acquaintances without worry. As for your candle-loving loved ones, well, a candle gift set is the perfect way to stay on their nice lists. The 2015 holiday season has given us a new batch of beautiful candle gift sets. Here are seven I’ve seen (and smelled!) around malls and shopping centers, and which I think would be ideal for anyone on your list. This set includes some of the Yankee Candle Company’s most intoxicating winter scents—Berry Trifle, Winter Glow, Bundle Up, Cozy by the Fire and Sparkling Balsam. It’s a great combination that includes sweet, woodsy, and cozy scents for a range of experiences. 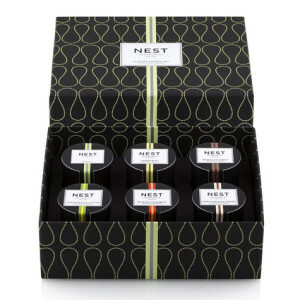 NEST is a luxurious experience from the moment you touch its soft, elegant gift box. This set includes six mini votive candles in Bamboo, Grapefruit, Moroccan Amber, Lemongrass and Ginger, Sicilian Tangerine and Vanilla Orchid and Almond. 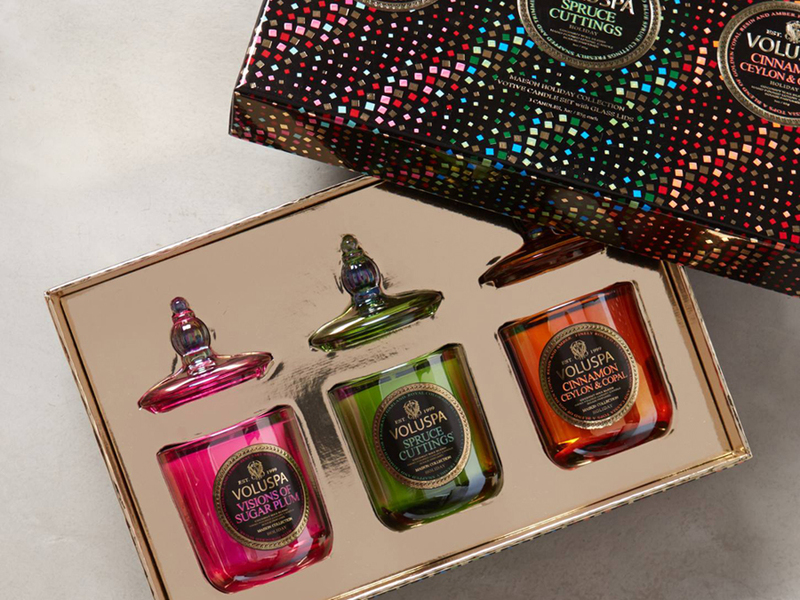 This gift set includes three festive fragrances: Cinnamon Ceylon & Copal, Spruce Cuttings, and Visions of Sugar Plum. Each of the three votive candles is housed in colored iridescent polished glass for which the possibilities for reuse are endless! Diptyque fans will love this set, which includes Baies, the company’s bestselling candle, which melds roses with blackcurrent undertones; Figuier, a blend of fig wood, leaves, and sap; and Roses, a delicate scent which truly captures the beauty of that flower. Perfect for the traveling candle lover! Aquiesse travel tin candles are perfect for popping in your suitcase and brightening up a hotel room. This set includes Black Sandalwood, Black Tea & Cognac, Black Cypress & Cassis, White Coral Musk, and White Iris & Vetiver. A luxurious splurge for the candle lover who has everything. This set includes five scents inspired by New York City with scents as full-bodied and colorful as their designs: Chelsea Flowers, Chinatown, Eau de New York, Nuits de Noho and The Scent of Peace. 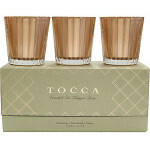 Tocca’s limited-edition Candele da Viaggio features three travel-size candles housed in rich gold scalloped glass and tucked in a beautiful green box. This set includes Venice, rosemary and pine scented Chamonix, and sweet tabak and vanilla scented Marrakesh.